Serving as the Presidency of COP 23, Fiji highlights the urgency of addressing vulnerabilities of small island developing states and others that are at high risk to or suffering now from the negative effects of climate change. According to the UNFCCC website, Fiji Prime Minister Voreqe Bainimarama aims to continue the momentum for action since the Paris Agreement entered into force last year toward fully implementing the agreement. The agreement calls for a balance between mitigation and adaptation, and increased global efforts to both reduce emissions and increase support to adaptation and building climate resilience. Much like the Adaptation Fund’s mission of funding concrete projects to help the most vulnerable communities in developing countries adapt and build resilience to climate change, raising support for adaptation and resilience-building for the most vulnerable nations is a priority. Fiji is an example of a country that is particularly vulnerable to climate change. Home to over 870,000 people, Fiji’s many volcanic islands include low-lying communities that are highly susceptible to devastating cyclones, high pressure systems and sea flooding. In 2012, Vunidogoloa became the first village to begin relocating to higher ground due to sea level rise. Climate change is expected to only worsen the situation in Fiji. Similar challenges are faced across the Pacific Islands, while limited resources make it difficult for smaller and vulnerable developing countries disproportionately affected by climate change to adapt. Fiji’s government is implementing projects with international financing support to increase its climate resilience. It is also a member of the Pacific Small Island Developing States and Climate Vulnerable Forum to boost climate action and ambition in vulnerable developing countries. At its 30th meeting in October 2017, the Adaptation Fund Board approved a US$ 4.2 million project in Fiji. The urban development project aims at increasing the resilience of informal urban settlements in Fiji that are highly vulnerable to climate change and disaster risks. The climate adaptation funding for Small Islands Developing States (SIDS) was further strengthened with the funding approvals for Guinea-Bissau and Solomon Islands. 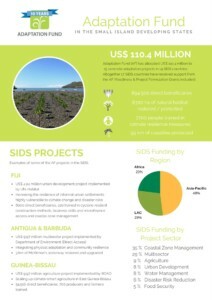 To date, the Adaptation Fund has allocated US$ 110.4 million to 15 concrete adaptation projects in 14 SIDS countries. Altogether 17 SIDS countries have received support from the AF (Readiness and Project Formulation Grants included). The Adaptation Fund is funding also many coastal management projects aimed at increasing resilience to sea level rise, extreme weather events and flooding while improving early warning systems and water security – including in similar island nations such as Antigua and Barbuda, the Cook Islands and Mauritius. Its accredited Regional Implementing Entity in Samoa, the Secretariat of the Pacific Regional Environment Program (SPREP), is also implementing a US$ 9 million coastal management project in the Federated States of Micronesia (FSM) to build institutional capacities and strengthen water and livelihood security measures to help six outer atoll islands adapt to climate change impacts related to water, health and sanitation. It is further providing communities with climate resilient infrastructure to help them relocate from high risk coastal flooding sites, and aims to capture and share adaptation knowledge to increase understanding about the kinds of interventions that work in island environments. Additionally, the Adaptation Fund innovated an alternative, streamlined accreditation process in 2015 to enhance access to climate finance for smaller implementing entities, and has accredited three national implementing entities through the process to date – including the Micronesia Conservation Trust in FSM and the Ministry of Finance and Economic Management in the Cook Islands.